Title: Biodiversity scenarios under the effect of climate change and future deforestation in Madagascar. Madagascar is widely known for its exceptional biodiversity both in terms of number of species and high endemism rates. This unparalleled biodiversity is severely threatened by both climate change and deforestation, the latter being associated to a rapid population growth. Using biodiversity maps and biodiversity data collected by the REBIOMA project (http://data.rebioma.net), associated to recently published demographic and deforestation models (http://phcfM.sf.net), we first propose to estimate the loss of biodiversity that would be associated with various scenarios of demographic growth and deforestation at the national scale. Second, we propose to estimate the loss of biodiversity that would be associated with various climate change scenarios (IPCC scenarios A2a and B2a for example) deriving future biodiversity maps (obtained from climatic niche models), and identifying climatic refugea areas and areas with high risk of biodiversity loss. Third, we propose to estimate the loss of biodiversity under both the effect of climate change and deforestation. Comparing present and future maps of biodiversity, we propose to identify high priority areas for biodiversity conservation (future biodiversity hotspots under threat of deforestation for example). 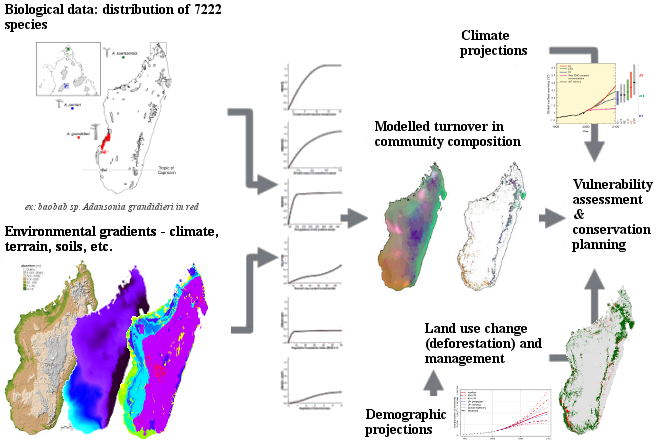 This results should help design a more effective protected area network in Madagascar and ensure that REDD+ national program occurring in Madagascar maximises the biodiversity co-benefits of new carbon projects.